Spike Lee’s semi-autobiographical trip back to Brooklyn circa 1975 is laced with some of the greatest soul hits of the era. Set consciously to them, the story of an only girl in an all boy family of five spins out like and extended compilation of funky episodic memories. Beginning with colourful shots of kids playing hopscotch and skipping rope on the pavement, it slowly focuses in on the chaos that reigns in the Carmichael’s house, an old brownstone with a hive of activity on the stoop. The high decibel madness is presided over by the matriarch Carolyn (Afre Woodard) who, apart from working as a school teacher, also combs the kids ‘fros and makes sure they eat all their black-eyed beans. The comb will eventually fall to 10 year old Troy (Zelda Harris) who, like her Mum, wears her hair in beaded braids, but right now Ladybug, as she’s affectionately called, is busy getting streetwise. At the corner store she sees RuPaul aka the Bodega Lady shimmy and shake and even tries her hand at shop lifting. After dark she and her siblings religiously tune into ‘The Partridge Family’ and learn all the hot new dance moves from ‘Soul Train’, a delicious archival chunk of which accompanies the entire end credits. 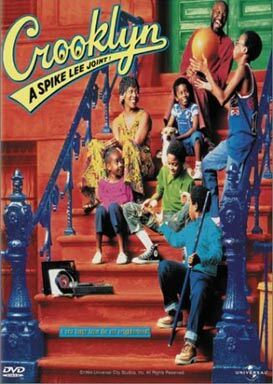 Crooklyn was written by Lee’s brother Cinque based on a story by his sister Joie who appears in the film as Aunty Maxine (the director also has a cameo as a drooling glue-sniffing freak named Snuffy). There’s some staged cruelty to animals – a cat gets used as a weapon and a dog gets crushed in the couch – but the film has some stunning camera work by Arthur Jafu and while it may not be Lee’s greatest achievement, it’s crammed full of heart and wrapped up in his singular kooky vision.